Reactivate stale or past Clients can bring you new customers…. Most businesses ignore them, successful businesses learn new ways to get them to recognize you as a market leader. When trying to re-establish relationships with past customers, some customers will be comfortable and feel as if they just conducted business with you yesterday while others will wonder why you went to the trouble of contacting them. Who is a reactivation candidate? To reactivate customers, you need to be attentive to the process. First, to determine which previous customers to reactivate, define what reactivation specifically means for your organization. Most companies define reactivation candidates based on their lack of response to previous marketing efforts. The typical sequential marketing efforts that an organization may follow begin with acquisition, then proceed to resell / upsell / cross-sell / downsell, retention / competitive defense / selective attrition and then reactivation. How do you differentiate between customers who require selling and retention efforts from those who require reactivation efforts? First, and most obviously, if you know that you’ve lost your customer’s business, then you’ve probably exhausted your sales and retention efforts and can assign the customer to your reactivation group. If you don’t know whether you have lost your customer’s business, make inquiries. If you find that it’s too expensive to keep in touch with customers, then analyze their buying history (e.g., length of time since last purchase, number of prior purchases, length of time between purchases and average order size) or apply industry averages to determine who might be a reactivation candidate. Whom do you select for reactivation? Before designating customers as reactivation candidates, determine whether you have their correct contact information. Exclude past customers who have outdated information that cannot be updated through third-party sources. Also, review any customer service or third-party data you have on reactivation candidates and categorize the reasons for lost business as “controllable” (e.g., shipped wrong product two weeks after promised delivery date) or “uncontrollable” (e.g., moved from retail area). If you’re to blame for the failed relationship, determine whether there is value in re-establishing it. Once you select your reactivation candidates, segment this group and test offers before spending money to reach them all at once. If possible, use lifetime value to determine which segments may yield a higher return. When do you conduct reactivation marketing? Reactivation is not a one-time event for when times are tough. Reactivation should be an ongoing activity prioritized among other marketing efforts. Once you have customers who meet your reactivation requirements, execute a reactivation campaign. (See “Reactivation Letters” in the Sales Letter Library). With response history, you can develop a reactivation response model to determine the optimal timing and frequency of your reactivation efforts. For example, a model developed for a health products cataloger might show that the company maximizes its marketing dollars when it tries to reactivate past customers with a buy-one-get-one-free offer after these customers fail to respond to three months of discount offers following their initial purchase. When you accumulate significant response history from your reactivation marketing efforts, build a model based on RFM analysis (recency, frequency, monetary) or data attributes that predict purchase propensity. A life insurance company might build a model based on age, number of children, marital status, income and interest rates to determine the likelihood of a previous term insurance customer buying a variable life policy. What do you say to customers you want to reactivate? People change over time and so does your business, so when you’re thinking about marketing to past customers, consider that your customers’ needs and preferences, as well as your business focus, may have changed. Profile customer’s to create more personalized communications for each segment. Use past data such as RFM information and, if possible, append reliable third-party information that will enhance your customer understanding. For example, you might use third-party information to determine each customer’s age, family situation and income. Then you could send targeted communications to various segments depending on these data attributes as well as results from an RFM analysis. In conjunction with customer profiling, make an in-depth determination as to why the relationship ended in the first place. Was it something you did? If so, you might have a manager or high-level executive make a personal call to “high-value” customers. When communicating with reactivation candidates, use the information you have about them in your marketing communications to show your desire to have them back as a customer. Also, if your communication is asking the reactivation candidate to call a person at your company, create a group of call specialists trained to handle reactivation customers. Investing in acquisition vs. reactivation. Acquisition and reactivation are both investments designed to yield profitable customer relationships. When deciding how much of your marketing budget should be allocated to each effort, calculate the ROI on reactivating old customers versus acquiring new customers. Whether reactivation involves less of an investment than acquisition depends on the extent of your data analysis, data enhancement and list rental costs. It’s generally true that with customer data available for analysis as well as past customers’ familiarity with a company’s name and product or service quality, reactivation efforts yield higher response rates and higher profitability than acquisition efforts do. 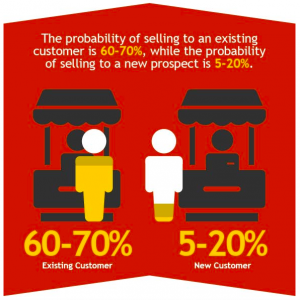 Most organizations focus on acquisition, sales to current customers and retention. They see little opportunity in marketing to people who failed to respond to their offers. These organizations, however, are typically not customer-focused. Instead of trying to understand why a prior customer is no longer responding, they assume that the customer is the problem in the relationship. The dynamics are similar to that of a person who refuses to talk to another person unless the other person reaches out first. Start looking at your past customers and commit to reaching out and re-establishing a relationship that is valuable to both sides. In my next blog I will show you the 8 Steps to Designing a Reactivation Campaign, stay tuned. If you need help reactivating stale clients, try our FREE test drive to gain access to our resources and tools, or you can also contact me directly.